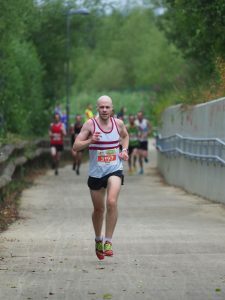 July 2018 Race Round Up - Civil Service Harriers A.C. The club has been busy with the 2 mile league over the past few weeks but in between we’ve had a number of club members taking part in a variety of races. First up was the Irish Runner 10 mile which took place in the Phoenix Park on a very warm Saturday. First club member home was Marie O’Connell in an impressive 1:17:54, placing her 9th in her category. Marathon training is obviously paying dividends for Marie. John Meagher wasn’t far behind in 1:18:56, followed by another great run from Marie Norris who finished in 1:28:40. As we know all too well, it’s impossible to do 10 miles in the Phoenix Park without hitting some hills, so great performances from the guys in very warm conditions. The Liberty 4 mile race took place on a balmy evening last week. We had a good showing from the club for this race which starts and ends in the Royal Hospital in Kilmainham, and twists and turns through the heart of old Dublin. First home was Bernard Duggan in 22:15, placing him 6th overall. Great running from Bernard! Biting at his heels was Patrick Coyle – masquerading as Collie – who finished in 22:17. Well done Podge. Jason Reilly also had another great run, finishing in 22:55. Jason was followed by Sean Ryan in a time of 24:19. Well done Sean. First lady home was Gemma Treacy who’s improving with each race. Gemma’s PB time of 26:18 placed her 4th overall, a measly 2 seconds behind the 3rd place finisher. Fantastic running from Gemma. Sally-Ann Lynch was next home in 29:17, followed by Emily Ennis in 31:59. Great running ladies! Finally we had the inaugural South Dublin 10k in Clondalkin last Sunday. While most of us were stewarding, we had a handful of club members running. Congratulations again to Patrick Coyle who finished 7th in his category with a time of 35:51. Was great to see Podge at the top of the field with the elites! Next home was Tony Garvin in 43:27, followed by Sunil Singh in 48:36 and Brian Boland in 50:11. Well done guys. Well done to everyone who’s been racing in the 2 mile league. Some great performances but I think everyone will be glad to see the back of Lord’s Walk! John is busy collating the results and we’ll have a report up here in the coming weeks.